Nestled along the Columbia River in Boardman, Oregon, the River Lodge and Grill is the perfect getaway to escape your daily routine. Select from three types of comfortable accommodations-Single Queen, Double Queen or Single King. Enjoy such amenities as cable / satellite TV, mini Refrigerators, microwave, voice mail and high-speed wireless Internet access. We offer innumerable amenities including an on-site restaurant, outdoor pool, private beach, business center and wireless Internet access in public areas. Activities such as hiking, biking, and boating are all available close to the River Lodge and Grill. The Grill offers delightful twists on your favorite comfort foods with astounding views of the Columbia River. Relax with a great meal along the riverside. What is happening in Boardman? Disconnect from your daily routine and take a trip to the nearby SAGE Center to learn about agriculture, or view the natural beauty of the night sky when you get far enough away from the lights of the city. Watch as river cruises and barges quietly glide up and down the Columbia River, between the world’s most inland seaport and destinations around the world. 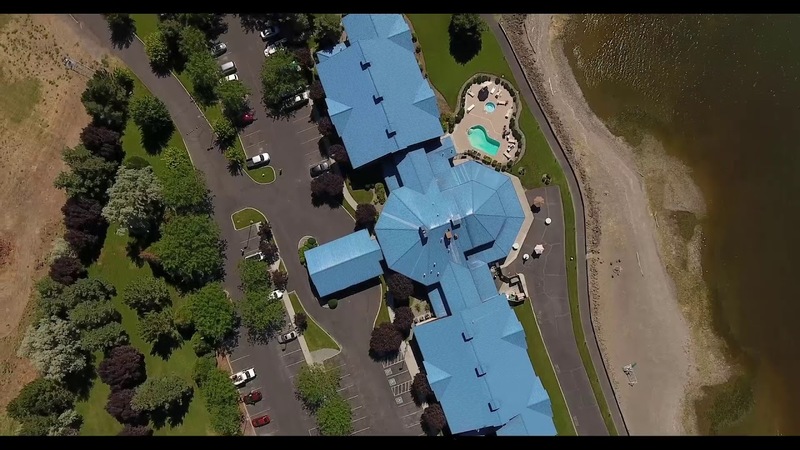 With its 48 beautifully-appointed, comfortable rooms, the River Lodge and Grill in Boardman, Oregon, raises the bar on convenience. Enjoy such amenities as cable/satellite TV, mini refrigerators, microwave, voice mail and high-speed wireless Internet access. This guest room features two comfy queen beds and plenty of amenities-including cable/satellite TV and high-speed wireless Internet access-to ensure a pleasant stay. Great for a foursome for a weekend of golf! This guest room features one comfy queen bed and plenty of amenities- including cable/satellite TV and high-speed wireless Internet access-to ensure a pleasant stay. The perfect place to call home on your fishing trip. A larger bed with sleeper sofa makes our Single King a singularly special place to come home to after a full day of activities in the Eastern Oregon region. Perfect for a romantic weekend away from the big city! Relax in our Business Suite, complete with a king bed, desk and a table with four chairs on one side and sitting room with a couch and two comfy chairs on the other side. Perfect for the business traveler staying multiple days! Great for the traveling family! Relax with a king bed, queen bed, two comfy chairs, a couch that folds out, desk and a table with four chairs. Retire here after a day exploring the SAGE Center and Columbia Gorge Discovery Center.